These highlights do not include all the information needed to use ZILRETTA safely and effectively. See full prescribing information for ZILRETTA. To report SUSPECTED ADVERSE REACTIONS, contact Flexion Therapeutics, Inc. at 1-844-FLEXION (353-9466) or FDA at 1-800-FDA-1088 or www.fda.gov/medwatch. 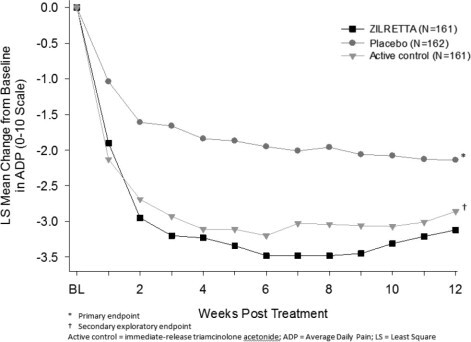 ZILRETTA (triamcinolone acetonide extended-release injectable suspension) is indicated as an intra-articular injection for the management of osteoarthritis pain of the knee. ZILRETTA is not intended for repeat administration [see Dosage and Administration ( 2.1)] . ZILRETTA is administered as a single intra-articular extended-release injection of triamcinolone acetonide, to deliver 32 mg (5 mL). ZILRETTA is for intra-articular use only and should not be administered by the following routes: epidural, intrathecal, intravenous, intraocular, intramuscular, intradermal, subcutaneous. ZILRETTA is not suitable for use in small joints, such as the hand. The efficacy and safety of repeat administration of ZILRETTA for the management of osteoarthritis pain of the knee have not been evaluated. The efficacy and safety of ZILRETTA for management of osteoarthritis pain of shoulder and hip have not been evaluated. Refer to the Instructions for Use for directions on the preparation and administration of ZILRETTA. ZILRETTA is supplied as a single-dose kit containing a vial of ZILRETTA microsphere powder, a vial of sterile diluent, and a sterile vial adapter. ZILRETTA must be prepared using the diluent supplied in the kit. Preparation of ZILRETTA requires close attention to the Instructions for Use to ensure successful administration. Use proper aseptic technique throughout the dose preparation and administration procedure. ZILRETTA is a suspension product and it is normal for some residue to be left behind on the vial walls after withdrawing the contents. Promptly inject ZILRETTA after preparation to avoid settling of the suspension. If needed, the ZILRETTA suspension can be stored in the vial for up to 4 hours at ambient conditions. Gently swirl the vial to resuspend any of the settled microspheres prior to preparing the syringe for injection. The usual technique for intra-articular injection should be followed. Aspiration of synovial fluid may be performed based on clinical judgment prior to administration of ZILRETTA. ZILRETTA is not interchangeable with other formulations of injectable triamcinolone acetonide. ZILRETTA is contraindicated in patients who are hypersensitive to triamcinolone acetonide, corticosteroids or any components of the product [see Warnings and Precautions ( 5.3) and How Supplied/Storage and Handling ( 16)] . [see Warnings and Precautions ( 5.2)]. Serious neurologic events, some resulting in death, have been reported with epidural injection of corticosteroids. Specific events reported include, but are not limited to, spinal cord infarction, paraplegia, quadriplegia, cortical blindness, and stroke [see Adverse Reactions ( 6)] . These serious neurologic events have been reported with and without use of fluoroscopy. Reports of serious medical events have been associated with the intrathecal route of corticosteroid administration [see Adverse Reactions ( 6)] . The safety and effectiveness of epidural and intrathecal administration of corticosteroids have not been established, and corticosteroids are not approved for this use. In particular, the formulation of ZILRETTA should not be considered safe to use for epidural or intrathecal administration. Rare instances of anaphylaxis have occurred in patients with hypersensitivity to corticosteroids. Cases of serious anaphylaxis, including death, have been reported in individuals receiving triamcinolone acetonide injection, regardless of the route of administration [see Adverse Reactions ( 6)] . Institute appropriate care upon occurrence of an anaphylactic reaction. Intra-articular injection of corticosteroid may be complicated by joint infection. A marked increase in pain accompanied by local swelling, further restriction of joint motion, fever, and malaise are suggestive of septic arthritis. If this complication occurs and a diagnosis of septic arthritis is confirmed, institute appropriate antimicrobial therapy [see Adverse Reactions ( 6)] . Avoid injection of a corticosteroid into an infected site. Local injection of a corticosteroid into a previously infected joint is not usually recommended. Examine any joint fluid present to exclude a septic process. Intra-articular injection may result in damage to joint tissues. Intra-articularly injected corticosteroids are systemically absorbed. Patients who are on corticosteroids are more susceptible to infections than are healthy individuals. There may be decreased resistance and inability to localize infection when corticosteroids are used. Infection with any pathogen (viral, bacterial, fungal, protozoan, or helminthic) in any location of the body may be associated with the use of corticosteroids alone or in combination with other immunosuppressive agents. These infections may be mild to severe. With increasing doses of corticosteroids, the rate of occurrence of infectious complications increases. Corticosteroids may also mask some signs of current infection. Advise patients to inform their health care provider if they develop fever or other signs or symptoms of infection. Advise patients who have not been vaccinated to avoid exposure to chicken pox or measles. Instruct patients to contact their health care provider immediately if they are exposed [see Patient Counseling Information ( 17)] . Corticosteroids can produce reversible hypothalamic-pituitary-adrenal axis suppression, with the potential for adrenal insufficiency after withdrawal of treatment, which may persist for months. In situations of stress during that period (as in trauma, surgery, or illness), institute corticosteroid replacement therapy. Metabolic clearance of corticosteroids is decreased in hypothyroid patients and increased in hyperthyroid patients. Corticosteroids can cause elevations of blood pressure, salt and water retention, and increased excretion of potassium. These effects are less likely to occur with synthetic derivatives. Monitor patients with congestive heart failure or hypertension for signs of edema, weight gain, and imbalance in serum electrolytes. Dietary salt restriction and potassium supplementation may be necessary. Corticosteroids can cause salt and water retention, and increased excretion of potassium. These effects are less likely to occur with synthetic derivatives. All corticosteroids increase calcium excretion. Monitor patients with renal insufficiency for signs of edema, weight gain, and imbalance in serum electrolytes. Dietary salt restriction and potassium supplementation may be necessary. Corticosteroid use may be associated with development or exacerbation of increased intraocular pressure. Monitor patients with elevated intraocular pressure for potential treatment adjustment. Corticosteroid administration is associated with increased risk of gastrointestinal perforation in patients with certain GI disorders such as active or latent peptic ulcers, diverticulosis, diverticulitis, ulcerative colitis and in patients with fresh intestinal anastomoses. Avoid corticosteroids in these patients because signs of peritoneal irritation following gastrointestinal perforation may be minimal or absent. Corticosteroids decrease bone formation and increase bone resorption through their effect on calcium regulation and inhibition of osteoblast function. Special consideration should be given to patients with or at increased risk of osteoporosis (e.g., postmenopausal women) before initiating corticosteroid therapy. Corticosteroid use may be associated with new or aggravated adverse psychiatric reactions ranging from euphoria, insomnia, mood swings, and personality changes to severe depression and frank psychotic manifestations. Special consideration should be given to patients with previous or current emotional instability or psychiatric illness before initiating corticosteroid therapy. Advise patients and/or caregivers to immediately report any new or worsening behavior or mood disturbances to their health care provider. The following serious adverse reactions are described elsewhere in the labeling. The data below reflect exposure to a single 32 mg intra-articular injection of ZILRETTA in clinical studies in patients with moderate to severe pain due to osteoarthritis of the knee. Clinical studies included randomized, double-blind, parallel-group, placebo and/or active-controlled, and pharmacokinetic/pharmacodynamic studies with follow-up ranging from 6-24 weeks. A total of 424 patients received ZILRETTA and 262 received placebo. Treatment emergent adverse reactions reported by greater than or equal to 1% of patients in the ZILRETTA arms are summarized below ( Table 1 and 2). Overall, the incidence and nature of adverse reactions was similar to that observed with placebo. The following adverse reactions, presented alphabetically by body system, are from voluntary reports or clinical studies of corticosteroids. Because some of these reactions are reported voluntarily from a population of uncertain size, it is not always possible to reliably estimate their frequency or establish a causal relationship to drug exposure. Anaphylactic reactions: Anaphylaxis including death, angioedema [see Warnings and Precautions ( 5.3)] . Cardiovascular: Bradycardia, cardiac arrest, cardiac arrhythmias, cardiac enlargement, circulatory collapse, congestive heart failure, hypertension [see Warnings and Precautions ( 5.7)] , fat embolism, hypertrophic cardiomyopathy in premature infants, myocardial rupture following recent myocardial infarction, pulmonary edema, syncope, tachycardia, thromboembolism, thrombophlebitis, vasculitis. Fluid and electrolyte disturbances: Congestive heart failure in susceptible patients [see Warnings and Precautions ( 5.7)] , fluid retention, sodium retention. Gastrointestinal: Abdominal distention, bowel/bladder dysfunction (after intrathecal administration) [see Warnings and Precautions ( 5.2)] , elevation in serum liver enzyme levels (usually reversible upon discontinuation), hepatomegaly, increased appetite, nausea, pancreatitis, peptic ulcer with possible perforation and hemorrhage, perforation of the small and large intestine (particularly in patients with inflammatory bowel disease) [see Warnings and Precautions ( 5.10)] , ulcerative esophagitis. Neurologic/Psychiatric: Convulsions, depression, emotional instability, euphoria, headache, increased intracranial pressure with papilledema (pseudotumor cerebri) usually following discontinuation of treatment, insomnia, mood swings, neuritis, neuropathy, paresthesia, personality changes, psychiatric disorders [see Warnings and Precautions ( 5.12)] , vertigo. Arachnoiditis, meningitis, paraparesis/paraplegia, and sensory disturbances have occurred after intrathecal administration. Spinal cord infarction, paraplegia, quadriplegia, cortical blindness, and stroke (including brainstem) have been reported after epidural administration of corticosteroids [see Warnings and Precautions ( 5.2)] . Ophthalmic: Exophthalmos, glaucoma, increased intraocular pressure [see Warnings and Precautions ( 5.9)] , posterior subcapsular cataracts, rare instances of blindness associated with periocular injections. No drug-drug interaction studies have been conducted with ZILRETTA. Table 3 contains drug interactions associated with systemic corticosteroids. Aminoglutethimide Aminoglutethimide may lead to a loss of corticosteroid-induced adrenal suppression. Amphotericin B injection and potassium-depleting agents When corticosteroids are administered concomitantly with potassium-depleting agents (i.e., amphotericin B, diuretics), observe patients closely for development of hypokalemia. There have been cases reported in which concomitant use of amphotericin B and hydrocortisone was followed by cardiac enlargement and congestive heart failure. Antibiotics Macrolide antibiotics have been reported to cause a significant decrease in corticosteroid clearance. Anticholinesterases Concomitant use of anticholinesterase agents and corticosteroids may produce severe weakness in patients with myasthenia gravis. If possible, withdraw anticholinesterase agents at least 24 hours before initiating corticosteroid therapy. Anticoagulants, oral Coadministration of corticosteroids and warfarin usually results in inhibition of response to warfarin, although there have been some conflicting reports. Therefore, monitor coagulation indices frequently to maintain the desired anticoagulant effect. Antidiabetics Because corticosteroids may increase blood glucose concentrations, dosage adjustments of antidiabetic agents may be required. Antitubercular drugs Serum concentrations of isoniazid may be decreased. Drugs which induce hepatic microsomal drug metabolizing enzyme activity may enhance metabolism of corticosteroids and require that the dosage of corticosteroid be increased. (e.g., ketoconazole) Ketoconazole, a strong CYP3A4 inhibitor, has been reported to decrease the metabolism of certain corticosteroids by up to 60% leading to an increased risk of corticosteroid side effects. 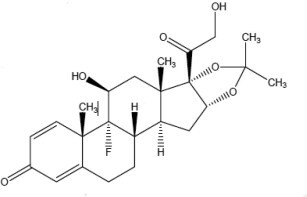 Cholestyramine Cholestyramine may increase the clearance of corticosteroids. Cyclosporine Increased activity of both cyclosporine and corticosteroids may occur when the two are used concurrently. Convulsions have been reported with this concurrent use. Digitalis glycosides Patients on digitalis glycosides may be at increased risk of arrhythmias due to hypokalemia. oral contraceptives Estrogens may decrease the hepatic metabolism of certain corticosteroids, thereby increasing their effect. drugs (NSAIDs) Concomitant use of aspirin (or other nonsteroidal anti-inflammatory drugs) and corticosteroids increases the risk of gastrointestinal side effects. Aspirin should be used cautiously in conjunction with corticosteroids in hypoprothrombinemia. The clearance of salicylates may be increased with concurrent use of corticosteroids. Skin tests Corticosteroids may suppress reactions to allergy related skin tests. Vaccines Patients on prolonged corticosteroid therapy may exhibit a diminished response to toxoids and live or inactivated vaccines due to inhibition of antibody response. Corticosteroids may also potentiate the replication of some organisms contained in live attenuated vaccines. If possible, defer routine administration of vaccines or toxoids until corticosteroid therapy is discontinued. There are no data regarding the use of ZILRETTA in pregnant women to inform a drug associated risk of adverse developmental outcomes. Published studies on the association between corticosteroids and fetal outcomes have reported inconsistent findings and have important methodological limitations. The majority of published literature with corticosteroid exposure during pregnancy includes the oral, topical and inhaled dosage formulations; therefore, the applicability of these findings to a single intra-articular injection of triamcinolone acetonide is limited. In animal reproductive studies from the published literature, pregnant mice, rats, rabbits, or primates administered triamcinolone acetonide during the period of organogenesis at doses that produced exposures less than the maximum recommended human dose (MRHD) caused resorptions, decreased fetal body weight, craniofacial and/or other abnormalities such as omphalocele (see Data) . The estimated background risk of major birth defects and miscarriage for the indicated population is unknown. All pregnancies have a background risk of birth defect, loss, or other adverse outcomes. In the U.S. general population, the estimated risk of major birth defects and miscarriage in clinically recognized pregnancies is 2% to 4% and 15% to 20%, respectively. The exposure margins listed below are based on body surface area comparisons (mg/m 2) to the highest daily triamcinolone acetonide exposure at the MRHD of 32 mg triamcinolone acetonide via ZILRETTA. Pregnant mice dosed with triamcinolone acetonide via intramuscular or subcutaneous injection at doses equivalent to 0.8 times the MRHD or higher during organogenesis caused cleft palate and a higher rate of resorption. In pregnant rats dosed with triamcinolone acetonide via intramuscular or subcutaneous injection at doses equivalent to 0.3 times the MRHD or higher during organogenesis caused developmental abnormality (cleft palate, omphalocele, late resorption, and growth retardation) and fetal mortality. No notable maternal toxicity was observed in rodents. Pregnant rabbits dosed with triamcinolone acetonide via intramuscular injection for 4 days during organogenesis at doses equivalent to 0.15 times the MRHD or higher caused resorption and cleft palate. No notable maternal toxicity was observed. Pregnant primates dosed with triamcinolone acetonide via intramuscular injection for 4 days during organogenesis at doses equivalent to 3 times the MRHD or higher caused severe craniofacial CNS and skeletal/visceral malformation and higher prenatal death. No notable maternal toxicity was observed. No peri- and post-natal development studies of triamcinolone acetonide in animals have been conducted. There are no available data on the presence of triamcinolone acetonide in either human or animal milk, the effects on the breastfed infant, or the effects on milk production. However, corticosteroids have been detected in human milk and may suppress milk production. It is not known whether intra-articular administration of ZILRETTA could result in sufficient systemic absorption to produce detectable quantities in human milk. The developmental and health benefits of breastfeeding should be considered along with the mother's clinical need for ZILRETTA and any potential adverse effects on the breastfed infant from ZILRETTA or from the underlying maternal condition. Corticosteroids may result in menstrual pattern irregularities such as deviations in timing and duration of menses and an increased or decreased loss of blood. The safety and effectiveness of ZILRETTA in pediatric patients have not been established. The adverse effects of corticosteroids in pediatric patients are similar to those in adults. Carefully observe pediatric patients, including weight, height, linear growth, blood pressure, intraocular pressure, and clinical evaluation for the presence of infection, psychosocial disturbances, thromboembolism, peptic ulcers, cataracts, and osteoporosis. Weigh potential growth effects of treatment against clinical benefits obtained and the availability of treatment alternatives. Of the total number of patients administered 32 mg ZILRETTA in clinical studies (N=424), 143 patients were 65 years of age or older. No overall differences in safety or effectiveness were observed between elderly and younger subjects, and other reported clinical experience with triamcinolone acetonide has not identified differences in responses between the elderly and younger patients, but greater sensitivity of some older individuals cannot be ruled out. ZILRETTA (triamcinolone acetonide extended-release injectable suspension) is a microsphere formulation of triamcinolone acetonide, a corticosteroid, to be administered by intra-articular injection. ZILRETTA is formulated in 75:25 poly(lactic-co-glycolic acid) (PLGA) microspheres with a nominal drug load of 25% (w/w) and is provided as a sterile white to off-white powder. ZILRETTA is prepared with a supplied diluent containing an isotonic, sterile, aqueous solution of sodium chloride (NaCl; 0.9% w/w), sodium carboxymethylcellulose (CMC; 0.5% w/w) and polysorbate-80 (0.1% w/w) to form a 5 mL sterile suspension intended for intra-articular injection. Triamcinolone acetonide occurs as a white to almost white, crystalline powder having not more than a slight odor and is practically insoluble in water and very soluble in alcohol. Each vial of ZILRETTA powder contains 40 mg of triamcinolone acetonide in 160 mg of microspheres, resulting in 32 mg of deliverable triamcinolone acetonide when prepared according to the Instructions for Use. Triamcinolone acetonide is a corticosteroid with anti-inflammatory and immunomodulating properties. It binds to and activates the glucocorticoid receptor, leading to activation of anti-inflammatory transcription factors such as lipocortins and inhibition of inflammatory transduction pathways by blocking the release of arachidonic acid and preventing the synthesis of prostaglandins and leukotrienes. Studies indicate that following a single intramuscular dose of 60 to 100 mg of immediate-release triamcinolone acetonide injectable suspension, adrenal suppression occurs within 24 to 48 hours and then gradually returns to normal, usually in 30 to 40 days. To assess potential effects of the systemic levels of triamcinolone acetonide associated with a single intra-articular (IA) administration of ZILRETTA on hypothalamic pituitary adrenal (HPA) axis function, serum and urine cortisol levels were monitored over 6 weeks post injection. Adrenal suppression with ZILRETTA occurred within 12-24 hours and then gradually returned to normal, within 30-42 days. Corticosteroids may increase blood glucose concentrations. In a study where 18 patients with osteoarthritis knee pain and controlled type 2 diabetes mellitus received a single IA injection of ZILRETTA into the knee, the change from baseline in average blood glucose over the 72 hours after injection as measured by a continuous glucose monitoring device was 8.2 mg/dL (95% confidence interval 0.1, 29.2). ZILRETTA is an extended-release dosage form consisting of microspheres of poly(lactic-co-glycolic acid) (PLGA) containing triamcinolone acetonide. Plasma pharmacokinetic parameters for triamcinolone acetonide following IA administration of ZILRETTA or 40 mg immediate-release triamcinolone acetonide into the knee are provided in Table 4. Long-term animal studies to evaluate the carcinogenic potential of ZILRETTA have not been conducted. Adequate mutagenicity studies have not been conducted with ZILRETTA. Studies in animals to evaluate the impairment of fertility of ZILRETTA have not been conducted. The efficacy of ZILRETTA was demonstrated in a multi-center, international, randomized, double-blind, parallel-arm, placebo- and active-controlled study in patients with osteoarthritis pain of the knee. A total of 484 patients (ZILRETTA 32 mg, N=161; placebo [saline], N=162; active control [a crystalline suspension, immediate-release formulation of triamcinolone acetonide 40 mg], N=161) were treated and followed for up to 24 weeks. Patients had a mean age of 62 (range 40 to 85 years); baseline demographics and disease characteristics were balanced across treatment arms. Twenty-five percent (25%) of patients had received at least one prior corticosteroid intra-articular injection more than 3 months prior to treatment. A total of 470 patients (97%) completed follow-up to Week 12, the time point for primary efficacy determination, and 443 (91.5%) completed to Week 24. The primary efficacy endpoint comparing ZILRETTA to placebo was change from baseline at Week 12 in the weekly mean of the Average Daily Pain intensity scores (ADP) as assessed by a 0-10 Numeric Rating Scale (NRS). ZILRETTA demonstrated a statistically significant reduction in pain intensity at the primary endpoint vs placebo. ZILRETTA also demonstrated a reduction in pain intensity scores each week from Weeks 1 through 12 ( Figure 1). In a secondary exploratory analysis, statistical significance was not demonstrated between the ZILRETTA and the active control (immediate-release triamcinolone acetonide) treatment groups for the change from baseline at Week 12 in weekly mean ADP. ZILRETTA NDC 70801-003-01 ZILRETTA (triamcinolone acetonide extended-release injectable suspension) single-dose kit. ZILRETTA microsphere powder NDC 70801-001-01 5 mL single-dose vial to deliver 32 mg of triamcinolone acetonide supplied as a sterile, white to off-white powder in a cerium glass (clear) vial with a rubber stopper and an aluminum seal with a gray plastic cap. Diluent NDC 70801-002-01 5 mL single-dose vial supplied as a sterile, clear liquid solution of 0.9% w/w sodium chloride (normal saline) containing 0.5% w/w sodium carboxymethylcellulose, and 0.1% w/w polysorbate-80 in a glass vial with a rubber stopper, aluminum seal and white plastic cap. To maintain expiry period, refrigerate the ZILRETTA single-dose kit (36°-46°F; 2°-8°C) before use. If refrigeration is unavailable, store the ZILRETTA single-dose kit in the sealed, unopened kit at temperatures not exceeding 77°F (25°C) for up to six weeks and then discard. Do not expose the ZILRETTA single-dose kit to temperatures above 77°F (25°C). Do not freeze. Store vials in carton. Inform patients that they may be more likely to develop infections when taking corticosteroids. Instruct patients to contact their health care provider if they develop fever or other signs or symptoms of infection. Advise patients who have not been vaccinated to avoid exposure to chicken pox or measles. Instruct patients to contact their health care provider immediately if they are exposed [see Warnings and Precautions ( 5.5)] . There are a number of medicines that can interact with corticosteroids such as triamcinolone acetonide. Advise patients to alert their health care provider(s) to assess the need to adjust their medication(s) [see Drug Interactions ( 7)] . Inform patients that corticosteroid use may be associated with adverse psychiatric reactions. Advise patients and/or caregivers to immediately report any new or worsening behavioral or mood disturbances to their health care provider [see Warnings and Precautions ( 5.12)] . ZILRETTA and Flexion are registered trademarks of Flexion Therapeutics, Inc. Copyright © 2018 Flexion Therapeutics, Inc. All rights reserved. For more information, go to ZILRETTA.com or call 1-844-FLEXION (353-9466). ZILRETTA must be prepared using only the diluent supplied in the kit. To ensure proper dosing, it is important that you follow the preparation and administration steps outlined in these instructions. Promptly inject ZILRETTA after preparation to avoid settling of the suspension. ZILRETTA is supplied as a single-dose kit and administered as a suspension containing microspheres. The ZILRETTA powder vial contains an overfill to allow the appropriate dose to be withdrawn. ZILRETTA is a suspension product and it is normal for some residue to be left behind on the vial walls after withdrawing the contents. Inspect all kit components to confirm they have not expired and the seals are intact. For additional information, visit www.zilretta.com or call Flexion Therapeutics at 1-844-FLEXION (353-9466). Place two paper towels or a pad on a properly-cleaned hard surface. Grip the top of the ZILRETTA powder vial and tap firmly and repeatedly on the padded surface. Tap the vial until excess powder is dislodged from the vial and stopper ( Fig. 2). Before continuing, ensure that powder moves freely within the vial. As shown in Figure 3, the vial on the left, with the X, requires additional tapping because the powder is not properly dislodged. The vial on the right shows the powder properly dislodged and ready for the next step. Remove the flip-off caps from the ZILRETTA powder and diluent vials ( Fig. 4). Clean the ZILRETTA powder and diluent vial tops with an alcohol pad. Use a separate alcohol pad for each vial. Peel Off Vial Adapter Cover. Peel off the paper cover from the vial adapter package ( Fig. 5). Leave the adapter in the plastic holder. Attach Vial Adapter to ZILRETTA Powder Vial. Grip the plastic holder that contains the vial adapter. As shown in Figure 6, place the ZILRETTA powder vial on a flat surface. In a vertical orientation, gently push the adapter down onto the ZILRETTA powder vial until the spike on the adapter penetrates the rubber stopper on the ZILRETTA powder vial. The adapter will snap into place. Attach a needle to the syringe and remove the needle guard. With a syringe and needle, withdraw 5 mL of diluent. Remove the plastic holder from the vial adapter ( Fig. 7). Remove the needle from the syringe containing diluent. Attach the syringe onto the vial adapter by pushing down and turning clockwise until you feel resistance ( Fig. 8). Slowly and completely push down the syringe plunger to transfer the diluent into the ZILRETTA powder vial ( Fig. 9). Note: Equalize the pressure in the syringe by slowly pulling back the plunger to the 5 mL mark. Ensure that no solution is drawn back into the syringe at this stage. Mix Diluent and Powder ( Fig. 10). With the syringe still attached to the ZILRETTA powder vial, hold the syringe and vial at a slight angle. Tap the bottom edge of the vial firmly and repeatedly, in a circular motion, on the padded surface. Swirl gently every five or six taps. Tap for at least one minute until all powder is completely dispersed. Note: Avoid vigorous shaking of the vial to minimize foaming. Note: At least one minute of tapping and gentle swirling is required to achieve uniform suspension. Inspect the ZILRETTA powder vial to ensure no clumped powder is visible and a uniform suspension has been achieved. A properly mixed suspension will be milky white, contain no clumps, and move freely down the vial wall. As shown in Figure 11, the vial on the left, with the X, requires more tapping and gentle swirling because the powder is not mixed properly with the diluent. The vial on the right shows the powder properly mixed and ready for the next step. Note: If needed, the ZILRETTA suspension can be stored in the vial for up to 4 hours at ambient conditions. The syringe must remain on the vial adapter while the suspension remains in the vial. Swirl the vial gently for at least 10 seconds to ensure the powder is fully suspended. Immediately depress the plunger fully and then invert the syringe so the vial is directly on top of the syringe ( Fig. 12). Hold the syringe in a completely vertical position, per the illustration on the right, in Figure 12. Withdraw the full contents from the ZILRETTA vial into the syringe. Note: ZILRETTA is a suspension product and it is normal for some residue to be left behind on the vial walls after withdrawing the contents. Remove the syringe from the vial adapter by turning counter-clockwise. Attach a new needle to the syringe and remove the needle guard. Inspect for bubbles with the syringe held in a completely vertical position (needle upward). If bubbles are observed, gently tap the syringe with your finger until the bubbles rise to the top. Eliminate all bubbles by slowly depressing the plunger to displace the air from the syringe. Remove and discard the needle. 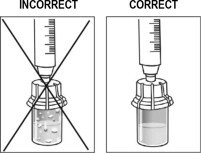 To ensure the powder is suspended, gently invert the syringe containing ZILRETTA several times just prior to administration, as shown in Figure 13. Grip the syringe firmly and turn it so the syringe plunger is pointing straight down. Then turn the syringe gently, 180 degrees, until the plunger is pointing straight up. Invert the syringe several times to ensure a properly mixed suspension. A properly mixed suspension will be uniformly milky white and contain no clumps. As shown in Figure 14, the syringe on the left, with the X, requires more inversions (turning) to properly mix the suspension. The syringe on the right shows the suspension properly mixed and ready for the next step. The usual technique for intra-articular injection should be followed. Aspiration of synovial fluid may be performed based on clinical judgment prior to administration of ZILRETTA. Do not reuse excess ZILRETTA. Any excess suspension in the vial should be thrown away immediately after the injection. Leftover ZILRETTA in the vial must never be reused for another injection. Note: The entire contents of the syringe must be injected to ensure the intended dose of ZILRETTA is delivered. Note: Discard all used components in an appropriate medical waste container according to local regulations. Note: ZILRETTA is for intra-articular use only. ZILRETTA is not intended for epidural, intrathecal, intravenous, intraocular, intramuscular, intradermal, or subcutaneous use. Single-dose kit. Discard unused portion.